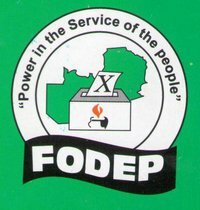 The Foundation for Democratic Process (FODEP) has called on the Patriotic Front government to promote and protect the universally recognized rights of freedom of expression and association, enshrined in the Bill of Rights in the Zambian Republican Constitution. In a statement, FODEP Executive Director Chimfwembe Mweenge said the ability to exercise the said rights, free of intimidation and penalty, is critical in enabling the Zambian people to hold government officials accountable as well as political players to organize and communicate with the public. “We note with great concern that there appears to be a systemic growing trend of curtailing freedom of expression particularly divergent views – be it on online media, TV and Radio, Newspaper . Political and civil rights should not be curtailed under the pretext of maintaining law and order. “Political players have a constitutional right to interact with their supporters share their ideologies and indeed express divergent views on the government that is how democracy operates. Article 60 of the amended Republican Constitution guarantees this right,” he said. Mr Mweenge who was commenting on the recent detention of a Muvi TV reporter who was covering the UPND leaders when police blocked them from appearing on radio Mano in Kasama, explained that the country cannot agree on everything but that divergent views will make the country’s democracy healthy. “It is not expected that we shall always agree on national matters but the difference in ideologies and opinions is what makes a healthy democracy. Zambians remain opposed to the one party dominion and monopoly over the governance system thus it becomes vital to secure the right of opposition political parties to share their views and contribute to the provision of checks and balances on the government. “The continued use of Zambia police officers to unlawfully break up meetings of rival political parties as was witnessed yesterday in Kasama when police ordered Radio Mano to cease the broadcasting of a live paid for meeting of the UPND is a national embarrassment on our democratic credentials. And should be stopped forthwith,” he said. He added “FODEP calls on the ruling PF government and State functionaries such as the Zambia Police to allow all Zambian citizens to enjoy their constitutional fundamental freedoms of assembly, association and expression. We demand an enabling environment for public participation in governance of the nation by all even when their views may not be liked by those in the ruling party. Fodep are misguided. PF are not in the political game to develop Zambia but their own pockets. Freedom of expression will soon get these thieves out. Unlike MMD that had pillars of democracy and development, PF had none. That’s why it was Donchi Kubeba or Dununa Reverse. And that’s why you will see political respression escalate from now onwards. Zambia will never be the same again. MUNE BUCK TEETH IT IS NOW KNOWN AS DUNUNA REGRET.